Media: Bristol Festival of Ideas donated all the media relations supporting the Jimmy Wales Wikipedia 10 talk in Bristol in January 2011. The publicity that ensured a sell out for the event in a single day. The Festival of Ideas team will support Wikimania 2013. Events complementing Wikimania will be organised by Bristol Festival of Ideas  which will also help with administration and publicity. So, they'll coordinate arrangements on Key Note speakers of the calibre of:Clay Shirky,Cory Doctrow,Jimmy Wales,Brian Solis,Stephen Fry,Tim Berners-Lee. Flights The bid team has agreed a working plan with Bristol Airport  on arrangements for Wikimania 2013. The airport will lead negotiations directly with specific airlines to secure discounted seat deals for delegates. It has agreed to allow Wikimania 2013 to 'take over' Bristol airport to organise an offical 'Welcome' desk, with supporting banners, flags and welcome material. It has agreed to provide supporting staff as well. Proposed dates: The proposed dates are 8-12 August 2013. Falling immediately after Ramadan concludes to allow Muslims to fly and to attend. Wikimania would be a major event in a recognized major city (the 8th largest) in the UK That, combined with the excellent working relationship between the local Wikimedia UK members and the city's administrators, is why hosting the event in Bristol would get wide and generous support from the city's council, universities, businesses and all related institutions. Most of the costs would be defrayed within the many offers of help and support from the city. Many local groups have already sponsored Wikimedia UK events in Bristol and will do so again. Bristol is the place to make Wikimania 2013 happen and the bid asks for your support. The proposed event will be based around the University of Bristol campus - with breakout events across the centre of the city at other possible venues. The University of Bristol and sister organisations in the city have committed to make the following venues available to us during Wikimania. In addition to organizing lectures and studies throughout the academic year, the University team is highly experienced at hosting events and have offered its expertise in running the venue-related arrangements. So, the viability of organising large events for Wikipedia involving hundreds of people in the city has already been tested and works successfully. The Victoria Rooms, a familiar Bristol landmark, first opened its doors to the public in May 1842, and for many years served as the most important and lively cultural centre in the West of England. Charles Dickens delighted a large audience with a selection of readings on its stage. Although principally used as a centre for music making for the Department of Music, due to its versatile auditorium, elegant recital room and vast complex of teaching and practice spaces and recording studio, it has been a conference and event centre, hosting Jimmy Wales' only public speaking engagement during the 10th birthday of Wikipedia in January 2011. Situated near the top of Park Street on Queens Road in Bristol, the Wills Memorial Building  is a landmark building of the University of Bristol that currently houses the School of Law and the Department of Earth Sciences, as well as the Law and Earth Sciences libraries. It is the centrepiece building of the university precinct  and used by the University of Bristol for degree ceremonies which take place inside of the Great Hall. 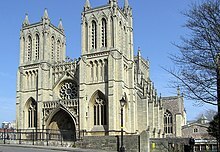 A church has stood on the site of Bristol Cathedral for over a thousand years. Bristol Cathedral is the premier example of a 'Hall Church' in Great Britain and one of the finest such examples anywhere in the world. Jimmy Wales hosted a school assembly for Bristol Cathedral Choir School in the Cathedral on 13th January 2011, when he spoke in the city as part of Wikipedia's 10th birthday celebrations. St George's is a church in the Clifton area of Bristol. It was built between 1821 and 1823 by architect Robert Smirke in a Greek Revival style. St George's was a "Waterloo church"— and the only one in Bristol to receive government money from the first grant under the Church Building Act of 1818. It has been designated by English Heritage as a grade II* listed building. In 1976 St George's Music Trust was formed and in succeeding years they established the church as a major concert venue. The main body of the church seats an audience of 562 and the crypt has been transformed into a bar and recording studios which are regularly used by the BBC. The Colston Hall is a concert hall and grade II listed building situated on Colston Street, Bristol. A popular venue catering for a variety of different entertainers, it seats 2,075 and provides licensed bars, a café and restaurant. Watershed opened in June 1982 as the United Kingdom's first dedicated media centre. It hosts three film theatres/cinemas, a café/bar, events/conferencing spaces, and office spaces for administrative and creative staff. The conference spaces and cinemas are used by many public and private sector organisations and charities. A 2010 report for the International Futures Forum describes the Watershed as "a creative ecosystem, operating in many different and overlapping economies," which is "pushing the creative boundary" by fostering both the invention and consolidation of new work. In January 2011, the University of Bristol hosted Jimmy Wales' only public lecture about Wikipedia's 10th birthday celebrations. The event was attended by 750 people, and streamed live to 3,500 worldwide gratis by Bristol City Council. Other sponsors of this event included Bristol Festival of Ideas, who helped publicise the event and ensure its success, HP Labs who met the costs of the University for the day, Bristol City Council , the Watershed, who donated rooms and staff time for the 20+ volunteers that Twittered and blogged about the day and BBC Bristol  which recorded the event professionally and has released the video under a public domain licence as part of the agreement. Jimmy Wales also hosted a morning assembly at the Bristol Cathedral Choir school during the morning of the same day as he spoke at the University . The staff at the school, the students and the Cathedral team were enthusiastic supporters of the day and they will be so again. Overall, the potential supporters have seen how working with Wikimedia UK and the wider Wikimedia global community has been successful and will be again. Bristol's local Wikipedians have begun building an outreach program. This has produced Training Days for both Wikipedian and non-Wikipedians Bristol Bristol Wiki Academy 1 and Bristol Wiki Academy 2, the first training day led to the growth of interesting future contacts from within the local Somali community and the Bristol Girl Geeks group. The second day involved volunteers from the city's two universities, BBC Bristol supporters and the head of the Knowle West Media Centre. In the summer of 2011 Bristol hosted a Wikipedian in Residence project for wildlife biodiversity charity ARKive where the biodiversity and environmental team donated 200 articles to Wikipedia and jointly collaborated on a project to improve the quality and broaden volunteer engagement and understanding ARKive. The public training session component of the work is highlighted in the news story at "Bristol ‘Wikipedians’ taught to edit online encylopaedia". The relationship with GGD began at the first Bristol Wiki Academy and had led to the start of a community-wide initiative to better understand and involve female Wikipedians. Last August a Wikipedian Training Day was hosted with the Bristol GGD members, organised by our University of Bristol Wikimedia Outreach Ambassador and led by leading female Wikipedians. The success of this initiative has spread to other cities with events now being hosted in Manchester and elsewhere. Business West, Bristol Media, the Pervasive Media Studios, the city's Economic Development team, the University of Bristol, the University of West of England, BBC Bristol and the Science Park are all committed to helping the bid team find additional sponsors as part of their support in kind. Sponsors have supported Wikimedia events in Bristol before. There is no need for external events management expertise as the event would be supported from budgets and resources within the city, and receive strong local support from a highly active digital and media community and local stakeholders. The University works closely with the regional and national business community. For Jimmy Wales' talk at the Victoria Rooms in January 2011, the costs of the hire for the event were all covered by HP Labs. The communications promotion was freely provided by the Bristol Festival of Ideas. The event was transmitted by Live web-cast for free by Bristol City Council. BBC Bristol made an independent recording of the event that they subsequently released under an open copyright licence. It has already been agreed with the University that the Wikimania team would work alongside them to replicate this arrangement. All parties have agreed that they would be interested in 'sponsoring in kind' in a similar fashion in 2013. In addition both Business West and the Bristol Chamber of Commerce have agreed that they would work with the Wikimania team to secure additional sponsorship opportunities. Other companies/groups committed include: Burges Salmon, Stone King, Bristol Wireless, Bristol Girl Geeks, ARKIVE/Wildscreen, Bristol Hackspace and Bristol Dorkbot. Bristol Media was established in 2005 and is managed by a team of some of the city’s leading industry heads. It has over 3500 subscribers and 500 paying members (January 2011) across the digital, TV, animation, design, marketing, PR, publishing, film and advertising sectors. Bristol Media supporters will be significant backers of Wikimania Bristol, should the city be selected. Fast track customs clearance both ways for delegates flying in from the Americas (via Dublin) in conjunction with its airline partner. Fast track entry into Bristol Airport by-passing customs and a guaranteed Welcome to Wikimania Desk & banners awaiting all delegates when they arrive in the airport from scheduled/agreed flights. Assistance to the Wikimania team in securing up-front deals with airlines flying in to Bristol to secure discounted seats for delegates. Bristol provides free Wi-Fi throughout the city. Inside the university there is a password-driven system that enables all users to access free Wi-Fi in any of the campus buildings. There is the capacity and the experience to manage a large number of delegates, as the current Wi-Fi works well with the existing student body of 15,107 people. To assist in securing the provision of laptop rental and on additional data-driven services the team will work with Bristol Wireless. With seven internationally recognised research councils based in the south west,Wikimania would reach out and involve them in a collaborative way, helping them better understand how Wikis and complementary technologies can promote participation, strengthen peer review and increase potential for education, public policy, social entrepreneurship, and development in the global south and throughout the world. This track will explore the ways that Wikimedia projects and related activities can be used in a shared and open fashion to meet collaborative objectives With two major universities in the city, the University of Bristol and the University of West of England , Wikimania will reach out and involve academics, student societies and local schools in the running of the conference and provide opportunities for informative events that develop the track further. Why do people contribute to Wikimedia projects? How might the community grow and expand while retaining its inherent cultural ethos? This track will explore the sociology of wiki culture and community and provide a forum for practitioners and researchers to share insights and best practices for community management, engagement, participation, and conflict resolution. We'd seek to create an expert discussion panel or forum to examine the gaps that exist between different community groups, related to gender and age, or to female and teenage participation. We would also actively encourage new ideas for the use of wikis as a tool for different gender and age group dialogues in this track. We'd seek to involve expert contribution and participation that could share expertise on a diverse range of topics including: technical development, philosophy and the humanities, communications, community management and collaboration, information science, and a broad range of other areas. This track would explore collaboration in research institutions and universities; and ways to improve contribution and content quality. This track will incorporate research and practice to showcase technology applications and theories, demonstrate new uses of existing and evolving technologies, and focus on applying technologies to meet user needs and improve the overall user experience. Issues and areas particularly of note in this track include: OTRS, MediaWiki development, semantic wikis, wiki-based Augmented Reality (AR), the use of QR codes, Wikipedia on mobile devices, User Interface Design, WikiLove, Liquid Threads and related technical focus points. Hiring the 170 year old SS Great Britain as an evening venue. The SS Great Britain was once the largest ship in the world and was the first streamship to cross the Atlantic. Training sessions for non-Wikipedians to learn how best to edit Wikipedia. In conjunction with the facilities provided by the Universities in Bristol, the Bristol team would run sessions for the public to learn how to edit Wikipedia and its sister projects. Taking advantage of any Wikipedian that arrives 'early' for Wikimania and is prepared to lend a hand in giving these training sessions would be our goal. In return for arriving early and offering up training, all Wikipedian teachers would receive help and advice on securing discounted rate accommodation in cities that they wish to visit after Wikimania with the full expert support of the Destinations Bristol tourism team behind them. This is likely to be a significant saving. Wikimedia UK and the Bristol team have built close relationships with the local Somali community in Bristol. The city council is also looking for new ways to involve and engage that hard to reach community. As part of the preparations for Wikimania, we'd like to work with local leaders and local government to organise training sessions in editing Wikipedia in local language community groups (such as the 32,000 Somalis) and to try and get 'ambassadors' from local communties to attend Wikimania as UK delegates to help others to learn about their experience. For Wikimania 2013 we shall reinforce and involve the inherent artistic cultural heritage of Bristol in several ways. We will involve acting companies from the Bristol Old Vic (one of the UK's oldest theatre companies) and the Tobacco Factory in providing special shows or discounted rates for existing shows for delegates. We will also involve the Young Company at the Old Vic, also recognised as one Europe's finest street theatre companies and we know from senior management that they'd be prepared to make a creative connection with Wikimania. Bristol is one of the pre-eminent European centres of creative and cultural industry and talent with a growing global profile. The region's creative industries are estimated to be worth £3 billion to the UK's economy. The creative industries in Bristol employ around 9,000 people, making up for 12% of all businesses in the city. Bristol is home to 1,350 creative businesses, including the multiple Oscar-winning Aardman Animations (the creators of Wallace and Gromit), as well as the BBC's world famous Natural History Unit, Endemol West and many other independent film and production companies. Bristol is the world capital of the wildlife and environmental film industry - responsible for 25% of this sector's global output, hosting the international 'Wildscreen' Festival every 2 years, and employing around 1,500 people. Another leading event is the 'Encounters Short Film Festival' that is held annually at the Watershed, the UK's first and most highly regarded media centre. The Bristol Design Festival, an annual celebration of creativity, design and innovation, is now also a hugely popular occasion. Apart from its film, broadcast and digital media companies, the city is justly famous for its varied and vibrant music scene - from the Bristol Bach Choir to the more subterranean 'Bristol Sound' in the form of Portishead, Roni Size and Massive Attack. Bristol also boasts a strength in other creative sectors unmatched by most other European regional cities - design and architecture, books and publishing, visual arts, theatre and performing arts, and a profusion of festivals and carnivals throughout the year, comedy clubs, street theatre and Europe's leading circus school. Creative quarters such as the Jamaica Street Studios, Knowle West Media Centre, Mivart Studios, Paintworks, Pervasive Media Studio, Spike Island and the Tobacco Factory are all examples of Bristol's vibrant creative community. Bristol city region is at the centre of a Silicon design cluster that is the second biggest in the world, after Silicon Valley. It is double the size of its nearest UK competitor, Cambridge, and in the last decade, start-ups in the South West have attracted more than $550 million in investment and returned more than $800 million to shareholders . In a recent NESTA report on semi-conductor industry in the UK Nesta identified Bristol and the south west as one of the major digital powerhouse regions in Europe . The Avon Gorge, home to several unique plant species. The Harbourside in Bristol, England, has hosted the Bristol Harbour Festival for 40 years, with over 250,000 visitors attending live music, street performances and a variety of live entertainment. The festival includes music stages, a dance stage, street theatre performances, and water displays. A highlight of the festival until 2010 was the Saturday Night Fireworks presentation.. Most of the activities are held near the waterfront, so a significant part of the festival is connected with the seagoing vessels moored nearby. The liveliest part of the festival is quayside, but the main attractions are, of course, seaside — with all the water displays, with tall ships from many countries and hundreds of sailing boats and old-time boats of all kinds. This event inspired similar events across the Channel, such as Les jeudis du Port and Fête Internationale de la mer et des marins in Brest, France, Brittany and other events across Western Europe. Bristol Harbour Festival celebrates the city's maritime heritage and the importance of Bristol's docks and harbour, and takes place at the end of July or the beginning of August. 2011 marked the 40th anniversary of the festival, and in 2013 is scheduled to include additional activities during the week of 23 - 29 July, before the main festival itself. Banksy is a pseudonymous England-based street artist/graffiti artist, political activist, film director, and painter. His satirical street art and subversive epigrams combine irreverent dark humour with graffiti done in a distinctive stencilling technique. Such artistic works of political and social commentary have been featured on streets, walls, and bridges of cities throughout the world. Banksy's work was born in the Bristol underground scene which involved collaborations between artists and musicians. According to author and graphic designer Tristan Manco and the book Home Sweet Home, Banksy "was born in 1974 and raised in Bristol, England. Known for his contempt for the government in labeling graffiti as vandalism, Banksy displays his art on public surfaces such as walls and even going as far as to build physical prop pieces. Banksy does not sell photos of street graffiti directly himself; however, art auctioneers have been known to attempt to sell his street art on location and leave the problem of its removal in the hands of the winning bidder. Banksy's first film, Exit Through the Gift Shop, billed as "the world's first street art disaster movie," made its debut at the 2010 Sundance Film Festival.. The film was released in the UK on 5 March 2010. In January 2011, he was nominated for the Academy Award for Best Documentary for the film. Banksy is the Wikimedian spirit of Bristol. The SS Great Britainis located in the heart of the city centre near the harbour, the ship was designed by Isambard Kingdom Brunel for the Great Western Steamship Company's transatlantic service between Bristol and New York. Now listed as part of the National Historic Fleet, Core Collection, the vessel is an award-winning visitor attraction and museum ship in Bristol Harbour, with between 150,000–170,000 visitors annually. Bristol Zoo was opened in 1836 by the Bristol, Clifton and West of England Zoological Society, Bristol Zoo is the world's oldest provincial zoo. It is a Victorian walled zoo located between Clifton Down and Clifton College, near Brunel's Clifton Suspension Bridge; it covers a small area by modern standards, but with a considerable number of species. In the 1960s the zoo came to national prominence by appearing in the UK television series, Animal Magic (TV series), hosted by the comic animal 'communicator', Johnny Morris. Morris would play keeper and voice all the animals there. Clifton Suspension Bridge originates from an idea of building a bridge across the Avon Gorge in 1753; originally for a stone bridge with later plans for a cast iron structure. An attempt to build Brunel's design in 1831 was stopped by the Bristol Riots, and the revised version of his designs was built after his death, being completed in 1864. The bridge is a distinctive landmark, used as a symbol of Bristol on postcards, promotional materials, and informational web sites. It has also been used as a backdrop to several films and television programmes. Bath is a city situated west of London and 13 miles south-east of Bristol. The population of the city is 83,992. It was granted city status by Royal Charter by Queen Elizabeth I in 1590, and was made a county borough in 1889 which gave it independence from its county, Somerset. The city was first established as a spa with the Latin name, Aquae Sulis ("the waters of Sulis") by the Romans in AD 43, although verbal tradition suggests that Bath was known before then. They built Roman Baths and a temple on the surrounding hills of Bath in the valley of the River Avon around hot springs. Much later, it became popular as a spa town during the Georgian era, which led to a major expansion that left a heritage of exemplary Georgian architecture crafted from Bath Stone. The City of Bath was inscribed as a World Heritage Site in 1987. M Shed is a museum in Bristol, England, located on Princes Wharf beside the Bristol Harbour|Floating Harbour in a dockside goods|transit shed that was previously occupied by the Bristol Industrial Museum. M Shed is home to displays of 3,000 Bristol artefacts and stories, showing a city that not only played a role in the slave trade but was also a major industrial centre with themes around transport, people, and arts. The new museum opened in June 2011, with exhibits exploring life and work in the city and was visited by over 500,000 visitors in its first 10 months. It has been nominated for European Museum of the Year 2012, long-listed for the Art Fund Prize 2012 and shortlisted for an M&H Award for Excellence 2012. To prioritise Wikimania Welcome arrangements at Bristol airport. Trains to Bristol are available from most of Britain, either directly or via a connection. From the rest of Europe you will have to change in London. Eurostar high-speed trains run between London (St Pancras International) through the Channel Tunnel to Paris (Gare du Nord), Lille and Brussels. During the summer an additional weekly train operates to Avignon. Through tickets and connections are available to Bristol from many European cities changing trains in London and in Paris, Lille or Brussels. Journey times to London average two hours fifteen minutes to and from Paris, and one hour fifty minutes to Brussels. Add 30 mins to an hour for the connection across London plus 2 hours for the train from London to Bristol. A second class return from Paris to London costs between €85 and €230. While it can be cheaper to fly from London to Paris using a low-cost airline, bear in mind that the journeys to the airports can be expensive and time-consuming. Bristol is easily accessible from both the M5 and M4 motorways. The journey time from west London to Bristol along the M4 is just under two hours. From the M4, exit at junction 19 (signpost to Bristol) and follow the M32 into the city centre. From the M5, exit at junction 18 and follow the A4 Portway (signpost Bristol Airport) into the city centre. Bristol Temple Meads is the main railway station, situated approximately 15 minutes' walk from the City Centre. The 8 and 9 bus services run frequently between Bristol Temple Meads Station and the city centre, Broadmead and Cabot Circus. CrossCountry trains operate between Bristol Temple Meads and Birmingham, the North East, Edinburgh and Penzance. First Great Western run regular services to Bristol from London Paddington, Reading, Swindon, Bath, Taunton, Exeter, Plymouth, Cardiff, Gloucester and Cheltenham. Bristol Parkway station is situated to the north of the city and can be accessed via bus service no. 73, which runs regularly between Bristol Parkway and the city centre. CrossCountry trains run services to Bristol Parkway from Penzance, Birmingham, the North East and Scotland. First Great Western also run services to, through and from Bristol Parkway. There is a direct connection to London Paddington station from both Temple Meads and Parkway stations, journey time is approximately 1hr 40mins. Many trains from Paddington stop at Reading which is connected to Heathrow Airport via the Heathrow RailAir coach, which takes around 30 minutes and travels both directions several times an hour. You can also get the Heathrow Express train from Heathrow to Paddington and change there onto a train to Bristol. Bristol Bus Station is situated on Marlborough Street, near Broadmead shopping centre. National Express coach services operate from the bus station to cities across the UK, including direct bus services to London Heathrow (approximately 2 hours) and Gatwick airport (approximately 3 1/2 hours). London Flyer coaches run between Bristol and London, and Megabus operates from Bristol to London and Wales (Cwmbran). Bristol Airport is situated just 8 miles south of central Bristol, and is easily accessed via the A38. Direct flights serve Bristol Airport from across the UK and Europe and regular routes operate from North America via Dublin. Bristol International Flyer express coach service offers a convenient way to get to the airport, with regular coaches running from Bristol city centre bus and train stations to the airport throughout the day. The journey takes around 30 minutes and tickets are available from the driver or at the airport itself. Heathrow Airport is on the Bristol side of London. It is Britain's busiest airport and has flights to all major cities around the world. See Bus and train sections above for travel between Heathrow and Bristol. Britain is not that big. Travel to Bristol from other British airports can be arranged but will take longer and be more expensive than travel from Bristol or Heathrow airports. The United Kingdom is a member country of the European Union. This means that all citizens of EU member states with a valid travel document (passport or European ID card) are allowed to travel freely within the European Union (including the UK) for up to 3 months. Given the high throughput of air traffic, the UK is a highly accessible country with those travelling from within the EU, North America, Japan, South Africa, Australasia or most of Latin America not requiring a visa to visit the UK. Many people from other regions will also be able to visit the UK without a visa. To determine whether you will need a visa to visit the UK, go to www.ukvisas.gov.uk. The nature of any visa required will depend on your nationality and your current country of residence. The typical cost for a VISA for a short visit to the UK is £76. Wikimedia UK may be able to act as a sponsor for those that require one in order to get a visa. All the countries below have visa-free access to the EU for at least 90 days. The University of Bristol has already pledged between 300 and 400 places in student halls of residences. Destination Bristol has committed to securing discounted rates with local hotels, with the local Youth Hostel Association and with United, which owns a larger stock of student accommodation located in the centre of the city near the harbour. All accommodation is within walking distance of all of the possible venues, with the halls of residences located around the beautiful Clifton Downs, near the Brunel Suspension Bridge. If there is any requirement for pre-event or post-event need for accommodation or facilities, Destination Bristol manages all tourism into the city and will offer and run a single point of contact website with the Wikimania team. All rates below are gross. With the assistance of Destinations Bristol the Wikimania Organisers would secure discounts from these gross rates. Renowned as one of the largest conference centres in the south west, the Bristol Marriott Hotel City Centre provides all the experience and support you need for a successful meeting, conference or special occasion. Located in the heart of the City & on the door step of the award winning Cabot circus shopping centre. The hotel offers 17 Meeting rooms with a total of 9,688 sq ft meeting space. The main Suite of the hotel is an instantly impressive venue for major events and special banquets. Fully air-conditioned and accommodating up to 700 guests for a reception, or up to 600 delegates theatre style and can be sub-divided into 3 separate sound-proofed areas, for different activities or smaller events. There are 300 bedrooms featuring en-suite bathroom, high-speed Internet access, iron, hair dryer, safe, with an onsite Gymnasium & leisure club including indoor pool, spa bath & steam room for use of all residents. Should you not be attending a private catering event at the Hotel, our Terrace Grill Steak house Restaurant offers an excellent selection of dishes using local quality produce. The majestic Bristol Royal Marriott Hotel is a unique gem located in the heart of the waterfront area of the city centre and can cater for every occasion. Overlooking the city's cathedral and historic harbour the hotel offers a perfect setting for business meetings, seminars and exhibitions. There are 22 superbly equipped rooms, all with natural daylight and fully air conditioned. The King's ballroom has its own bar, foyer and a balcony overlooking the cathedral. The hotel offers 242 bedrooms featuring en-suite bathroom, high-speed Internet access, iron, hair dryer, safe, with an onsite Gymnasium & leisure club including indoor pool, spa bath & steam room. Should you not be attending a private catering event at the Hotel, our Palm Court Restaurant & Club Lounge suits every occasion using local quality produce & offering our speciality afternoon tea’s. Located adjacent to the Cabot Circus Shopping Complex, Future Inn is situated close to the business district and within walking distance to nearby attractions. Just 10 minutes walk from Bristol Temple Meads station, 20 minutes drive from Bristol International Airport, the hotel is easily accessible from M4, M32 and M5. Our conference rooms span the entire top floor of the hotel offering panoramic views of Bristol's city skyline and offer flexible meeting, conferencing and banqueting facilities for any size group up to 300 people. Situated in the heart of the historic commercial centre of Bristol, the Thistle Bristol is an elegant and spacious hotel, which combines Victorian Tradition with stylish accommodation to offer the highest standards of service and quality. The hotel offers unrivalled meeting and events facilities in Bristol with a choice of 10 conference and banqueting rooms and suites. The Wessex Suite and the Ballroom have recently been refurbished to the highest standards. The Wessex Suite can accommodate up to 600 people in air-conditioned comfort for a theatre style event. It is also ideal for banquets, conferences or cocktail receptions preceding dining in the ball room. The 182 bedrooms all have en suite bathroom and shower, direct dial telephone, modem point, satellite TV & radio, trouser press, hairdryer, tea & coffee making facilities plus 24 hour room service. The Tyrells Restaurant is open for breakfast, lunch and dinner and offers a wide range of international cuisine in a refreshingly modern atmosphere. It represents excellent value for money and a dining option that many local non-residents regularly enjoy. Hotel guests can enjoy complimentary use of the Otium Leisure Club which features an indoor heated pool, whirlpool, sauna, solarium, steam room, beauty treatment rooms and full gymnasium. Adjacent to the hotel is a security monitored car park with 150 spaces. The 4 star Mint Hotel is located less than 5 minutes walk from Temple Meads railway station and is in easy access from all major motorway networks. Offering 167 bedrooms, our hotel is set up to meet the needs of any business or leisure traveller, incorporating free Wi-Fi as standard throughout the hotel. Apple i-Macs offer a fully integrated multi-media system in all our bedrooms. The hotel can accommodate meetings for up to 60 delegates in two meeting rooms, or exclusive events for up to 100 delegates including Christmas parties in our restaurant City Cafe. The Holiday Inn Bristol Filton is set amidst 16 acres of landscaped grounds within minutes of the M4/M5 motorway network and only 1.5 miles from Bristol Parkway railway station. The Hotel offers extensive conference and banqueting facilities with 18 meeting rooms ranging from 2-250 capacity. The 211 en-suite bedrooms are well equipped with tea & coffee making facilites, trouser press or iron & ironing board, hairdryer, mini bar, inter-active TV and pay movies and some have air conditioning. There is a choice of two restaurants, The Junction serves an extensive and contemporary a la carte menu while Sampans offers superb Oriental cuisine including Thai, Malaysian and Chinese. For a more informal atmosphere, the comfortable Bar and Coffee Lounge provides a range of light refreshments 24 hours a day. Residents can enjoy complimentary use of the Spirit Leisure Club incorporating heated swimming pool, sauna, solarium and gymnasium. Rates include or exclude VAT? Twin/Double/Single room - £65.00 on Bed & Breakfast basis. Holland House Hotel, one of Bristol's premier 4* city centre hotels for conferences, training courses, meetings, exhibitions, seminars, interviews and private banqueting events.The Mercure Bristol Holland House boasts 12 luxurious conference suites accompanied by a dedicated lounge and break out area with the flexibility to comfortably cater for intimate meetings of 8 or a banqueting feast for 220. All suites are air conditioned with the added extra of free broadband internet access. Dating from 1851, the Grange is an elegant Georgian country house hotel set in 18 acres of countryside only 7 miles north of Bristol and minutes from the M32, M4/M5 interchange. The Grange has 68 comfortable bedrooms and can accommodate meetings from one-to-one interviews to 150 delegates in the Park Suite which has its own bar. At the end of an intensive working day delegates can take a leisurely swim, sauna or spa bath in the Poolside Health Club and then relax in the Conservatory Bar before dining in the attractive restaurant. The Novotel Bristol Centre is situated in the heart of the city, only a few yards from Temple Meads railway station, with complimentary underground parking for 75 cars. Conferences for up to 250 delegates can be accommodated in the Victoria Suite located on the ground floor. This luxurious air-conditioned suite is an ideal venue for conferences, exhibitions and dinner dances. The suite can be divided into three self-contained rooms for smaller events. There are four purpose built Executive Rooms available for training courses or conferences for a maximum of 30 people. Adjoining each Executive Room is an inter-linked room, ideal for syndicate work. Situated on Bristol's harbourside, The Bristol Hotel enjoys a unique position in the heart of the city centre. The hotel is easily accessed from both the M4 and M5 motorways and is within half a mile of Bristol Temple Meads railway station. Parking is available for 400 cars in the adjacent NCP car park. The Meetings & Events Centre features 9 luxurious and well-appointed rooms which can cater for up to 400 people. The Ballroom, which features rich, deep carpets and Waterford crystal chandeliers acts as a stylish setting for larger events and conferences, while a number of smaller boardrooms can provide an ideal setting for small and medium sized events. The Meetings & Events Centre features the latest in business technology and equipment, while free wireless internet is available to visitors throughout the hotel. A separate conference entrance and a dedicated and experienced events team are there to ensure complete security and full attention to your meeting. The hotel also offers 187 bedrooms, and a vibrant bar and restaurant offering an ideal way to unwind. The University's policy of providing easy access to its impressive portfolio of historic and contemporary buildings opens up a wide spectrum of venues and facilities, you can choose from locations in elegant Georgian Clifton, leafy Stoke Bishop or the University precinct itself. As you'd expect from a leading university, you can gain access to tiered lecture theatres, an interesting variety of exhibition spaces, scores of meeting rooms, oak panelled banqueting halls, top notch sporting facilities and much more. And during the summer months, there's plenty of overnight accommodation available too, much of it en-suite, and at prices hard to match. The University's elegant and historic buildings are ideal for adding a touch of grandeur to your event. The neo-gothic panelled splendour of the Great Hall, for instance, could be just the backdrop you are looking for if you want to inject a touch of gravitas to proceedings. Or how about Holmes Hall, the secret wartime HQ of American General Staff before the liberation of Europe, now surrounded by an exotic botanical garden. Iconic venues like these could provide just the right kind of backdrop to your proceedings. No surprise that many of these venues are a big hit with wedding parties. Clifton Hill House, Goldney Hall, Burwalls and Royal Fort House are all licensed to conduct civil ceremonies. Viewing is recommended. All sites offer professional catering services too, and regularly serve everything from working lunches, to wedding fests and conference dinners. Although access to some venues is restricted to holidays, evenings or weekends, many of these excellent facilities are available throughout the year. The UWE Exhibition and Conference Centre offers a fully versatile and dynamic 4000 sq m space, providing you with the choice of utilising it as a single dramatic area, or dividing the space to fit your requirements. Three presentation suites and various meeting rooms are also available at UWE Exhibition and Conference Centre along with a wide range of meeting and presentation facilities. These are ideal for smaller gatherings, offering fully flexible seating arrangements for between 2 and 180 delegates. All rooms are equipped with the latest technology so whatever your business requirements, we can provide exceptional facilities which will ensure that each event runs like clockwork. The Exhibition and Conference Centre is set in the peaceful surroundings of the University's Frenchay Campus whilst offering a dedicated entrance and onsite parking for 450 cars. With excellent transport links for the M4, M5 and M32 motorways, Bristol Parkway train station being a 5 minute taxi ride away and Bristol Airport within easy reach, why go anywhere else? A wide variety of meeting and presentation rooms are also available on the main campus, offering a range of facilities for every event. The pound sterling (ISO 4217: GBP), known locally as the pound (£) is the currency of the United Kingdom, divided into one hundred pence (p). Currency exchange desks are available at all London airports, as well as at the Post Office and most banks and travel agents. Australian Dollars, Canadian Dollars, Euros, Japanese Yen, Polish Złoty, Swedish Krona and United States Dollars are all widely exchanged; other currencies are usually exchangeable at the airports. Situated in the south of the country, Bristol is one of the warmest cities in the UK, with a mean annual temperature of 10.2–12 °C. It is also amongst the sunniest, with 1,541–1,885 hours sunshine per year. The city is partially sheltered by the Mendip Hills, but exposed to the Severn Estuary and Bristol Channel. Rainfall increases towards the south of the area, with annual totals north of the Avon River in the 600 range, up to the 900 range south of it. Rain falls all year round, but autumn and winter are the wettest seasons. The Bristol Wikimania team will be drawn from local, national and international volunteers and representatives of open source groups, interests and alliances such as Bristol Wireless, BRRISM, Pervasive Media Studios, University of Bristol, University of The West of England, and local Wikipedians. The team leader is Steve Virgin, member of the UK Wikimedia Board. Samdownie Hello! I am a WikiMedia UK member, and helped to organise the 10th Anniversary of Wikipedia in Bristol. Destination Bristol We are the Bristol council body responsible for all tourism and conference events across the city. Panyd Hello! I am an administrator on the English Wikipedia. Michael Corbett Another Wikimedia UK member and another helper for Bristol's Wikipedia 10th Anniversary events in Bristol. Steve Woods Wikimedia UK member, Secretary of Bristol Wireless and local open source/free software advocate. Zoe local Wikipedian also involved with BathCamp and Bristol Girl Geek dinners. Matt Jukes Wikimedia UK member also involved with Mozilla and organising local and national web events. Martin Poulter Trustee of Wikimedia UK and experienced Wikipedian, with plenty of experience working with partner organisations, especially in research and academia. Rt. Hon The Lord Mayor Geoff Gollop I am writing to add my support to Bristol hosting the global Wikimania 2013. We believe that Wikimania 2013 will further increase Bristol's profile internationally as a creative and digital city. The event will benefit the city's residents and businesses alike, and bring additional visitors.Bristol is leading the way with our creative and digital industries, adding an estimated £3 Billion to the UK's economy. The City is home to an array of world recognised organisations including the multiple Oscar-winning Aardman Animations, the BBC's Natural History Unit and Endemol West to name but a few. We also boast our very own unique creative quarters, providing yet more excellent examples of Bristol's vibrant creative community. Bearing this, and the fact that UK Nesta identified Bristol and the south west as one of the major digital powerhouse regions in Europe, Bristol is without doubt the perfect choice for Wikimania 2013. We look forward to welcoming this event to this great city...Best wishes. Andrew Kelly The Festival of Ideas and Bristol Cultural Development Partnership are fully behind the bid for Bristol to host Wikimania. Bristol is the ideal city for this conference and gathering. We are a fully accessible city, have the people in place to make this happen, have the cultural and leisure facilities available to ensure that visitors cans get the most from their stay – and, above all, have people committed to the success of Wikipedia and all its projects. We will do all we can to make sure that the bid is a successful one, and that the delivery of the bid exceeds all the expectations of the judging panel. Christina Zaba A successful bid will be great for Wikimania - Bristol is the very best place to hold this event. With our tradition of tech innovation and communications, we'd make it a Wikimania to remember - celebrating the pioneering culture of both Wikipedia and Bristol, as well as building for the future in every sense. At Quayside Media we're going to be putting our best efforts into supporting both the bid and the event itself. Destination Bristol Destination Bristol is proud to support the Bristol bid. Working with businesses in the tourism, leisure, hospitality and retail industry across Bristol and the west of England, we can help the team bring this fantastic event to the city. We can offer a simple delegate accommodation booking system, provide advice and create opportunities for Wikipedians to fall in love with this incredible city. Samdownie Is proud to support the WikiMania Bid for Bristol 2013, and aim to help make it successful. Bs5er As stated on the page itself, I shall raise the bid at the next Bristol Wireless monthly meeting. I can also contact Bristol Hackspace and Bristol Dorkbot informally. They're more than likely to be supportive. Bristol Girl Geeks Group Girl Geek Dinners Bristol offer our support to the bid. Some of our members are very keen to participate and we have lots of ideas to contribute. TonyColl Yet again, Bristol proves that it's among the world's most innovative cities. R Powell The Marriott hotels in Bristol would be delighted to support in attracting this event to Bristol. The Marriott have over 500 rooms in Bristol, in addition to extensive conference space, and would be willing to offer favourable rates to attract Wikipedians to this great city. Methecooldude Would be fantastic to see it in Bristol, I live about 30 minutes train journey from Bristol and would totally support the event! MacTheDog Really hope this happens. Good luck. Sheldrake It's about time the UK hosted Wikimania, and it's great to see this comprehensive and coherent bid from Bristol. Lets go for it! Evans Finch Evans Finch would be delighted to support the bid however possible! Jennifer Unsworth Jennifer Unsworth is happy to support Bristol's bid - it would be great for our fab city to host such an exciting event! Llaisdy Wikimania is an exciting and important project and Bristol would be a very good venue. It would be very good for the UK to see such an important project in a real city outside of the capital. mrjohncummings Really great sounding and very comprehensive bid, happy to support it. Jezhotwells Experienced Wikipedian - Happy to support in any way that I can. Assuming 750 attendees, the amount of money spent is about £440 per attendee for the main conference (excluding airfare + own accomodation costs). Travel for VIPs £10,000 (tentative) VIPs would be international speakers flying in, possible sponsor guests or UK-based speakers. The amount is a ceiling per person and almost certainly will not be spent in each of ten cases as the amount is geared towards provision of international air far. ↑ "St. John's Ambulance Support for the Bristol Harbour Festival 2009". ↑ "Bristol Harbour Festival fireworks are cancelled". BBC News. 16 December 2010. Retrieved 16 December 2010. ↑ "Bristol City Council - Bristol Harbour Festival". Bristol City Council. ↑ Baker, Lindsay (28 March 2008). "Banksy: off the wall – Telegraph". The Daily Telegraph (London: Telegraph Media Group). Retrieved 24 June 2009. ↑ "Faces of the week". BBC News. 15 September 2006. Retrieved 26 January 2009. ↑ "Banksy fans fail to bite at street art auction". www.meeja.com.au. 30 September 2008. Retrieved 30 September 2008. ↑ "Banksy film to debut at Sundance". BBC News. 21 January 2010. Retrieved 12 April 2010. This page was last edited on 4 January 2018, at 14:36.